Here’s a pattern that you might see outside in the natural world at this time of year. What is it? 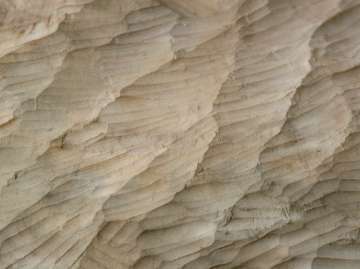 It’s a close-up of a pattern in wood, made by a beaver’s teeth chewing on a tree trunk. It’s the beginning of the new year, a new decade – a time for looking forward, a time for looking back, as most of us sit in our cozy Westborough homes this frozen month. What did we miss in the natural world last year? What might we see in the year to come? Did you notice the moon during the last few days of December? It may have been hard to see at its fullest on New Year’s Eve, when night was cloudy, but it was a blue moon. These days, that name means it was the second full moon in a single month – something we get to see only every two and half years or so. We can look forward to the next blue moon in August 2012. But there have been other definitions of “blue moon.” One gives that name to the third full moon in a season that contains four full moons (instead of the usual three). By that definition, the recent New Year’s Eve full moon doesn’t count, but we can look forward to a blue moon this coming fall, in November 2010. And speaking of the moon and things to look forward to, mark your calendar for the next full eclipse of the moon, on December 21, 2010. What else can we look forward to? Think about the wild plants and animals you might see in Westborough as 2010 progresses. Fuel your expectations by doing our annual Nature Notes quiz. For extra fun, try the quiz as a family, science class, scout troop, or other group. Throughout most of Westborough’s history, knowledge of our local plants and animals was common everyday knowledge. Let’s not lose it! Below you'll find short descriptions of plants, animals, or things featured in Nature Notes in 2009. Match these descriptions with names in the list of possible answers that follows. If all – or almost all – of your answers are correct, email your name or your group’s name to us at NatureNotes@westboroughlandtrust.org . We'll congratulate the top scorers in a future issue of the Westborough New – the more the better. 1. A diving animal with a skinny tail that uses cattails both as food and building material. 2. A good thing in winter for certain local turtles and frogs, as well as for polar bears in the Arctic. 3. 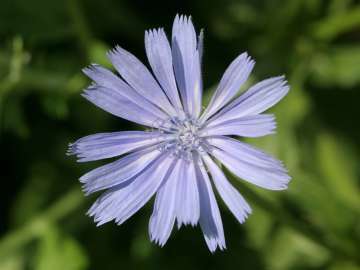 This weedy roadside plant with blue daisy-like flowers and a deep root can be used as a flavoring or a substitute for coffee. 4. 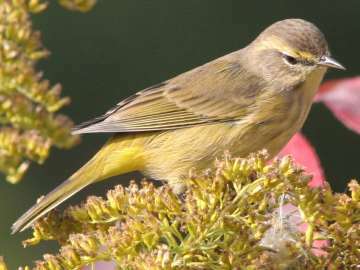 An invasive bird that starts to whistle in February as it begins to search for nest holes. 5. An insect being used in Massachusetts and elsewhere to control a pretty but invasive plant that is taking over wetlands in North America. 7. A wild member of the dog family that often lives closer to us than we realize, and has many cat-like traits, including eyes that see well in the dark, a habit of pouncing to capture prey, and a fondness for hunting mice and other rodents. 8. A butterfly that’s a near look-alike for the monarch butterfly but resembles a bird dropping in its caterpillar stage. 9. A tiny animal that starts trilling loudly in late June but is hard to see because it changes color to match its surroundings and can climb up trees and shrubs thanks to its swollen toe pads. 10. A large animal known for chewing down trees and building dams that create new wetlands that become home to lots of other wildlife. 11. An animal that’s peaceable in the water but fearsome if threatened on land, where it goes to lay eggs in warm, sandy spots. 12. A primitive plant that Native Americans and early settlers used by the handful to scour and scrub pots and pans because of the silica in its stems. 13. A butterfly with thin tails and showy eyespots that fool birds into attacking the rear wings of the butterfly instead of its head. 14. A shrub with pink pea-like blossoms that often marks the spot where a garden once grew, enriches poor soil with nitrogen, and serves as a food plant for caterpillars of the silver-spotted skipper butterfly. 15. Our state bird, which communicates details about predators and remembers where it hides seeds. 16. A small fall-blooming plant that is parasitic on the roots of beech trees. 17. A blue bird that catches and swallows insects on the wing as it swoops over fields and ponds, and competes with bluebirds for tree holes and nest boxes. 18. An invasive shrub with gray-green foliage, masses of fragrant, small white blossoms in the spring, and loads of small, juicy red berries flecked with silver in the fall. 19. One of three similar-looking insects that fly in the woods or around outdoor lights in late fall or early winter, looking for mates. 20. 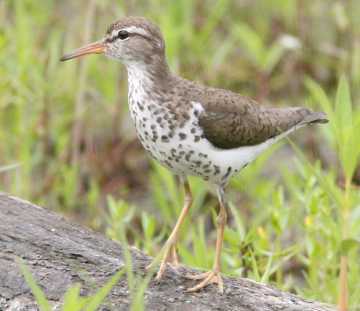 A fresh-water shorebird that reverses the usual male and female roles, with the female staking out a territory, displaying to attract males, and laying eggs for one or more males, which serve as Mr. Moms, incubating eggs and tending chicks. Go to Answer Key on page 17.